With the Army and Marine Corps stretched to breaking in Iraq and Afghanistan, the Navy is scrambling for ways to contribute more to inland fights. One result is a new river boat squadron, second of its type, stood up two weeks ago. Riverine Squadron Two and its sister, Ron One, are part of Navy Expeditionary Combat Command, which gathers all the Navy's coastal and land forces under one banner and adds brand new capabilities. NECC -- based alongside patrol boats (pics!) and amphibious ships at Little Creek, Virginia -- includes construction battalions, logistics troops, harbor patrol units, ordnance disposal teams and the new riverine squadrons, and is the subject of a story in the current issue of Defense Technology International. "It was definitely the ongoing war that created the idea," says Captain Robert McKenna, NECC's 44-year-old training officer. "We realized that the Army and Marine Corps were nearing capacity and that there was more to be done. We were looking for ways for the Navy to contribute more. Then we started looking out and said, the Navy really is contributing. And the sailors contributing the most in theater are the ones wearing this uniform." He gestures to his green and brown fatigues, the same ones worn by the Navy's 16,000 Seabees, 3,000 port cargo handlers and hundreds of Explosive Ordnance Disposal experts -- all of whom have been busy abroad in recent years. "They had no type command that took care of their Title X functions: training, equipping, manning." "We saw a need to put them into a coherent structure and better equip them," adds NECC commander Rear Admiral Donald Bullard, 55. "And then, all of the sudden, we began to look at other capabilities" including Navy civil affairs and riverine. Riverine forces in nimble, heavily-armed boats played a huge role in the Vietnam War, but were run down after the evacuation of that country as the Navy shifted focus on deterring the Soviet Navy. 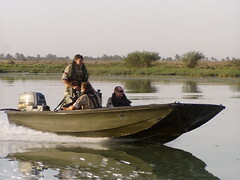 In Iraq, a country crisscrossed by large rivers, canals and marshes, the U.S. and British militaries (pictured) found themselves chasing down waterborne smugglers and insurgents in jerry-rigged engineer boats until specialized forces could be reconstituted. The U.S. Marines sent its new boats to patrol Haditha Dam, a major power-generating station in western Iraq, but wasn't happy diverting money and resources to a mission that once belonged to the Navy. By 2005, the Corps was ready to divest itself of the riverine mission. Then-Chief of Naval Operations Admiral Vern Clark sensed this. "Admiral Clark asked, Marines how can I help?" explains Lieutenant Commander Mike Egan, 44-year-old commander of Riverine Squadron One. "One of the ways was, hey, this riverine mission thing. That was the impetus that got the whole riverine thing rolling. NECC will have three squadrons, each with 224 sailors and, eventually, a combination of 39-foot Small Unit Riverine Craft, built by Raytheon, and smaller Special Operations Craft-Riverine, built by United States Marine. The goal is to get 16 boats per squadron," says Ron One's Lieutenant Chris Cowart, 40. The total includes eight SURCs and at least four SOC-Rs. "The balance could be either." Until enough boats are manufactured, the Navy is borrowing SURCs from the Marines at Camp Lejeune, North Carolina, for training and plans to fall in on the Corps' boats at Haditha Dam when it first deploys a squadron to Iraq in 2007. Their mission in Iraq will be much like the Marines', patrolling waterways, landing Marines and Masters at Arms for raids or riverbank security, searching small boats to interdict insurgents and illegal weapons. While the missions and platforms are the same, the Navy is adding high-tech capabilities to its riverine squadrons that the Marines have lacked. In addition to the usual bank of radios, Navy SURCs will feature digital network terminals in order to plug into the Army's command and control architecture. And, according to Lieutenant Christopher Farricker from Riverine Group One, the Navy is shopping for a small UAV that can boost a four-boat patrol's situational awareness. The idea, he says, is to get that "bird's eye view and give it back to the boat operator." The service hasn't down-selected types yet.